Simply Oregon stock a huge range of Oregon Flitch ready to be cut to size for Queensland Builders, Architects and Carpenters specifications. 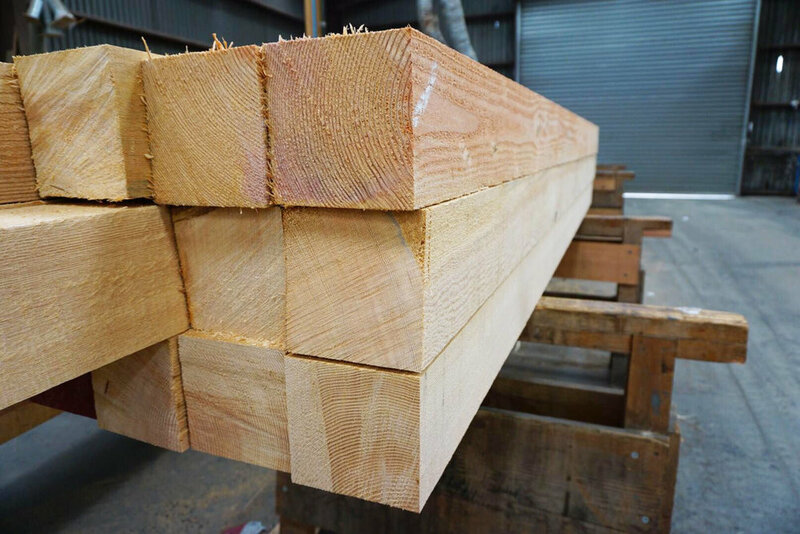 Our Oregon Timber is used for a variety of projects in VIC from large architectural projects to the small home handyman carpentry jobs supplied either dressed , bandsawn or rough sawn with Oregon Posts always F8 FOHC (Free of Heart Centre) or even F11 FOHC if required. Oregon timber orders are usually delivered overnight to Brisbane Metro with Outer Brisbane areas in approx 2-3 working days. Treated timber orders being approx. 10-14 working days depending on the area of Queenland being delivered to. See more details here (link to treatment page) about our timber treatments. Check out the tight growth rings on these superb pieces of Oregon (Douglas Fir) timber. Quarter sawn to be square dressed and shipped off to the wood turners in Brisbane. This Douglas Fir has experienced slower growth rates due to limited light and competition from the other trees. Because of this slow growth rate, the growth rings on the trees are packed very tightly together which gives the wood some big benefits resulting in a higher structural value. The unique aesthetics of the Douglas Fir make the lumber an attractive material for use by builders and designers alike. In addition to strength, each log is hand selected based on straightness of grain and consistency of size which in this case are perfect for wood turners projects.